This book describes the complex structures of heparins and heparan sulfates (heparinoids) and how they are generated by their biosynthetic pathways. The book also details the methodologies for studying these structures and their cellular metabolism. Heparin-Binding Proteins introduces the general nature of interactions between heparinoids and proteins, and presents the role for these structures in their interactions with the proteins of the hemostatic mechanisms, fibroblasts growth factors, superoxide dismutase, and lipoproteins. Biochemists and cell biologists; clinicians with an interest in the cardiovascular field. Preface. Conventions, Abbreviations, And Terminology. Heparin Vs. Heparan Sulfate. Structures of Heparinoids. Experimental Approaches for Determining Heparinoid Structures. Structural Modification of Heparinoids. The Cellular Metabolism of Heparan Sulfate. Interactions Between Heparinoids and Proteins. Antithrombin: The Prototype for Heparin-Binding Proteins. Heparin-Binding Proteins in Hemostasis. Fibroblast Growth Factors. Extracellular Superoxide Dismutase. Heparin-Binding Proteins in Lipoprotein Metabolism. Epilog. 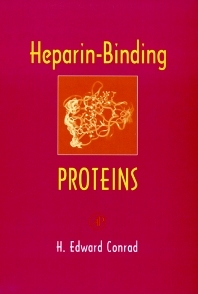 Appendix: Other Heparin-Binding Proteins. Subject Index. School of Chemical Sciences, University of Illinois, Urbana, U.S.A.